You might have though that Sam and Fuzzy was above the kind of filthy humour found in today's strip. Well, if you did, then boy do you look silly now! We're doing quite well on the Top Web Comics list -- at the time of this newspost, Sam and Fuzzy is less than 40 votes away from cracking the top ten. Thank you to everyone who takes the few seconds to vote each day, and by all means, please keep it up! Well, it may be my birthday today, but it's also my first day of my fourth year of classes at the good old University of Victoria. 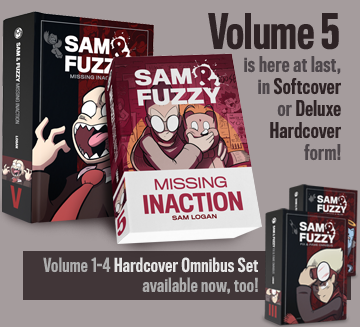 I'll be pretty durn busy, but no worries -- there won't be any lack of Sam and Fuzzy madness as a result. Just a lack of sleep had by me. Gurgle! Hey look, the hippos are fighting again. Well, since it is the start of a new month, I'm going to once again ask you all to please vote daily for Sam and Fuzzy at Top Web Comics. 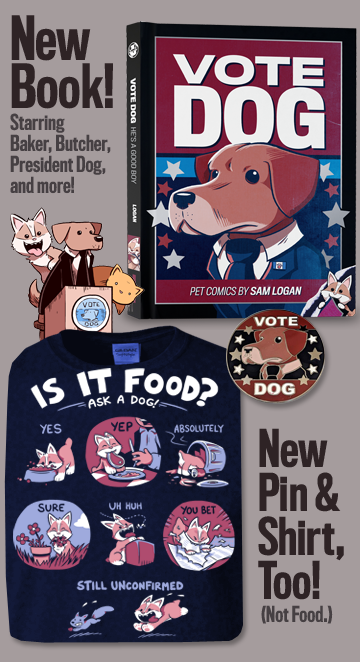 I really try not to harp about voting too much, but the fact is that ranking high on TWC helps new readers find the comic, and Sam and Fuzzy would easily place in the top ten if even half of it's readers took the few seconds it takes to vote each day. If you're of the sort that needs extra motivation, my birthday is this Wednesday! Remember my little rant about Disney last week? Well, if you want to remember the kind of quality work of which Disney is actually capable when they try, check out the Who Framed Roger Rabbit Vista Series DVD. Not only does this sucker have the brilliant original movie, but also it has the three short Maroon Cartoons that Disney paired with various live action flicks in the early 90s. Those shorts are quite possibly the only slapstick cartoons ever made that live up to the golden era of Looney Toons. It's fantastic stuff. I have been such a consumer the last few weeks. I've already tried to satiate my desire to acquire crap by picking up the new CD's from Sloan, The Dandy Warhols and Audioslave, but that hasn't been enough. By some fantastic (or horrible) twist of fate, both the Soul Calibur II and F-Zero GX Gamecube games have been released within days of each other. And then there's the Forces of Evil full length CD, Friend or Foe, which I have been meaning to get since basically forever. I yearn for these items like a impatient six-year old, which is pretty sad considering I'm turning 21 next week. For some people, I suppose, maturity hits a little later. Have you been reading Scary Go Round lately? John A is really at the top of his game right now. Every new SGR script should be met with equal parts joy and amazement.